Water damage is the number one reason for home insurance claims in North America. So how can you prevent your home from being another statistic? Installing a water leak alarm and shutoff valve is a great start, just having a simple way to shut the water supply to your home if/when a leak is detected can instantly reduce any damage from a potential leak and many insurance providers offer discounts if these preventive systems are installed in your home. So, what type of shut off valve is right for you? We carry three distinct options. 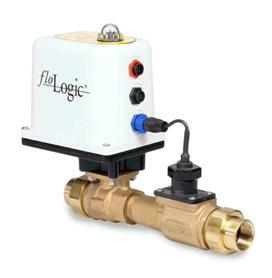 Flow Activated Valve – The FloLogic system is a flow meter and shutoff valve all in one. Simply install the valve/flow meter at the point where you’d like the water supply to be cut off in the event of a leak. The system comes with a control panel allowing you to easily toggle the valve and flow meter between ‘Home’ and ‘Away’ settings. For example in the home setting you may want to timer to run for 30 minutes or more before shutting the valve to allow for long showers, dishwashers etc., but in away mode 30 seconds or 1 minute of flow may be your limit before telling the valve to close shutting off the water. 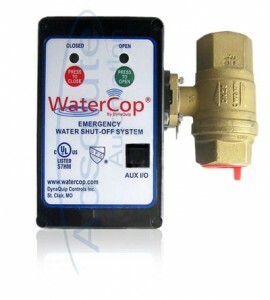 Leak Sensor Activated Valve – The WaterCop leak sensor and shut off system utilizes wireless sensors which you can place where ever you’d like in your home (as many as you want!). Again, simply install the shutoff valve where you’d like the water supply to be cut off in the event of a leak. If any of the wireless leak sensors detect water in their area they will instantly send a signal to the valve to close, shutting off the water supply and stopping the flow. 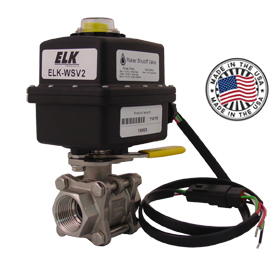 Generic Shut Off Valve – The ELK WSV2 is a high quality 12VDC shut-off valve. It can be connected to any alarm system or sensors with NO or NC outputs. Perfect for tying into existing home security or home automation systems.